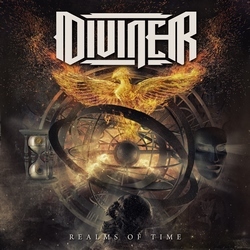 DIVINER is a heavy/power metal band from Greece founded by long-time friends and music partners Yiannis Papanikolaou (vocals) and Thimios Krikos (guitar) in the summer of 2011. The two of them also formed the well known Greek heavy/power metallers InnerWish back in 1995 playing in their debut album “Waiting for the Dawn” (1998) but after this release they had a long break of different musical quests. Their new vision was to proudly express themselves by creating and playing something powerful, intense, deep, heavy, dark, melodic and inspired that at the same time would sound up to date. All this without losing the elements that reflect the essence of pure and timeless magic of metal music. They were joined in the band by George Maroulees (guitar), Herc Booze (bass) and Fragiskos Samoilis (drums) and a deal was inked with the Swedish label Ulterium Records.